Living a Fit and Full Life: NIV, Revolution Bible: The Bible for Teen Guys from Zondervan is Perfect for Teen Guys! 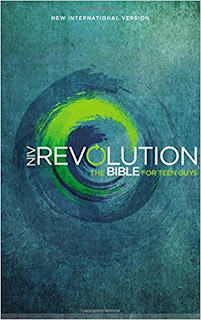 NIV, Revolution Bible: The Bible for Teen Guys from Zondervan is Perfect for Teen Guys! 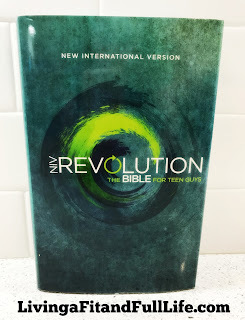 NIV, Revolution Bible: The Bible for Teen Guys from Zondervan is Perfect for Teen Guys! I absolutely love that this bible teaches teen guys how to have a revolutionary life for God. The NIV, Revolution Bible is perfect for young men ages 13-18 and has some pretty impressive features. As a homeschooling mom I love the in-depth book introductions that give an overview of the context of each book in both the Old and New Testaments. I also really like the “Christianity 101” section because it introduces teens to the basics of Christianity. The “Battlelines” section is also a great section because it answers tough questions that teens have and presents the Bible’s perspective on spiritual growth and contemporary cultural topics. The NIV, Revolution Bible: The Bible for Teen Guys from Zondervan is designed to empower teen guys in their quest for truth and I truly believe it does an amazing job to do just that! It's the perfect bible for those both new and old in their faith! You can find NIV, Revolution Bible: The Bible for Teen Guys by Zondervan on Amazon, Barnes and Noble and other bookstores.